Chicken Lettuce Wraps have become one of my favorite lunches since turning to keto. Before a keto lifestyle I had no idea how great of a vessel lettuce could be for meats, veggies and sauces. You really aren't missing out on anything without the bun or bread. You get the best part of the sandwich or wrap without the sluggish feeling you get after eating all those carbs! When it comes to our day-to-day, Matt and I like to make our first meals (usually a late breakfast or lunch) our carbiest meals, and this lettuce wrap will do the trick. It's not very high on carbs by any means, but it can pack a lot of veggies and avocado, and the peanut chicken, marinated in peanut butter brings in a couple carbs too! We like to get most, if not all of our carbs from veggies due to its high fiber content. I love lettuce wraps because I can fill them with whatever I want or whatever I have in the fridge! I can keep it super simple with some meat and cheese or go a little wild like we did with this Peanut Chicken Wrap. Some other great ideas are using lettuce wraps for fajitas, burgers, as taco shells, or for a deli meat sandwich like at Jimmy Johns. We find that not only is swiss chard a great option for the wrap portion of this meal, but so are collard greens - feel free to use either! What we love so much about wraps as meals is that you get to choose what ever foods you like or foods that go well together, insert them into more food (the wrap), do a quick wrap up and then eat! If you're just as big a fan as us of wrapping foods inside other foods you should give our Low Carb Tortillas and Low Carb Naan a try! But, if you're looking for something quick and easy to take on the go, definitely give our Peanut Chicken Lettuce Wrap a try! 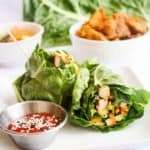 Recipe can be quickly added to MyFitnessPal - Search "KetoConnect - Peanut Chicken Lettuce Wraps"
Slice chicken into small bit sized places and set aside. Combine all ingredients in the marinade and toss the sliced chicken in the marinade. Let it marinade in the fridge for 1-2 hours. Once chicken is done marinating add ghee to a medium-high heat pan and add the chicken to the pan. Allow the chicken to cook through and crisp up (as seen in video). This took us about 7-10 minutes. Transfer chicken from pan to a bowl. Cut the rib out of a swiss chard leaf and cut in half. Layer the two leave over one another. Place 1/4 chicken, 1/4 vegetables, 1/4 sliced avocado and some cilantro (optional) onto one end of the leaf and roll it up, tucking in the side. You can use a tooth pick to reinforce the wrap! Repeat with all the leave until you have four wraps. Serve with a side of Sriracha or additional peanut sauce. Enjoy!